Guest Blog Post by Rebecca Herz: How can museums contribute to dialogue about social justice when we are exemplars of segregation? We’re fans of Rebecca Herz’s blog at MuseumsQuestions.com, and found her most recent post about the role museums can play in social justice issues to be particularly prescient, and so with her permission, are sharing it here with you. Interestingly, the many issues that Rebecca discusses from the viewpoint of social justice dovetail nicely with many of our own motivations for creating CultureSpots: to help museums expand their audiences, and make their visitors’ experiences more personal, engaging and relevant. It is our hope that museums continually strive to heed Rebecca’s call, and in-so-doing, become more diversely representative of the communities they serve and the infinitely fascinating stories that can help bring them together. At the PlayHouse last weekend we celebrated Eid-al-Fitr — the Muslim holiday marking the end of Ramadan — as part of our Celebrate Peoria series. One visitor approached the manager on duty that day, and asked her if we would be celebrating Christmas. When she told him that we do not have plans to do so, he let her know that he might be asking for a refund on his membership. Eid-al-Fitr at the PlayHouse. Left: A visitor gets henna on her hand. Right: Two visitors try on traditional Muslim clothing. Within our wonderfully diverse country, we live shockingly segregated lives. According to a recent article in The Atlantic, 75% of Whites have entirely White social networks. In Peoria, there are very few, if any, public spaces where one mingles with a population that mirrors the diversity of the city. When I lived in Brooklyn, while the playground was integrated, for a long time our local school (like many New York City schools) was not. Recently my facebook feed featured links to articles on how to talk to your child about race and how to educate yourself about race. We wouldn’t need these articles if we occupied social spaces in which meaningful cross-racial dialogue were common. I visited Milwaukee recently, and went to both the Milwaukee Art Museum and to a beach located just north of it. The museum was fantastic (kudos on the amazing building, the phenomenal educational spaces and materials, and the wonderful and well-curated permanent collection galleries), but the visitors I saw were almost all White, and I suspect skewed toward the economically privileged end of the spectrum. The beach, on the other hand, was beautifully diverse. Not only were people of all colors present; there were people in all sorts of family groups and clothing choices, signalling differences in cultural background and economic means. How can museums contribute to creating broad social understanding, and meaningful dialogue on social issues, when we are exemplars of segregation? Museums historically serve wealthy, white audiences. In a country that is 63% white, museums serve an audience that is 88% white (see this 2010 report from Reach Advisors). We are historically, and continue, in large part, to be elitist institutions, run by Boards comprised of the 1%. For those of us who want museums to be spaces of social justice, the most important first step is to attract and welcome an audience that represents the diversity of the United States. When we foster dialogue with others just like us, we leave satisfied but unchanged. When we address social justice issues with our current audiences, we are primarily reaching White liberal educated audiences. We are rarely reaching the people who would leave a museum because it celebrates Eid-al-Fitr and not Christmas, or hearing other perspectives in the dialogue we promote. When someone walks into the Peoria PlayHouse Children’s Museum, I want them to see a group that represents the full diversity of Peoria – to see a crowd more like the Milwaukee beach than the Milwaukee Art Museum. Is this possible? I’m not entirely sure it is, but it is important to try. And while I think many museums envision and work towards a truly diverse visitorship, it may be that children’s museums may have a particularly important role to play, because our target audience is still malleable – they are the potential social justice advocates, and potential bigots, of the future. (1) Offer free or reduced price admission for at least some visitors. Welcoming only visitors who can pay full admission, or only offering free admission on selected days, means that most of the time we drastically limit who we let in the door. Diversity means economic diversity as well as racial diversity. We need mechanisms in place that allow everyone to enter at a price they can easily afford. 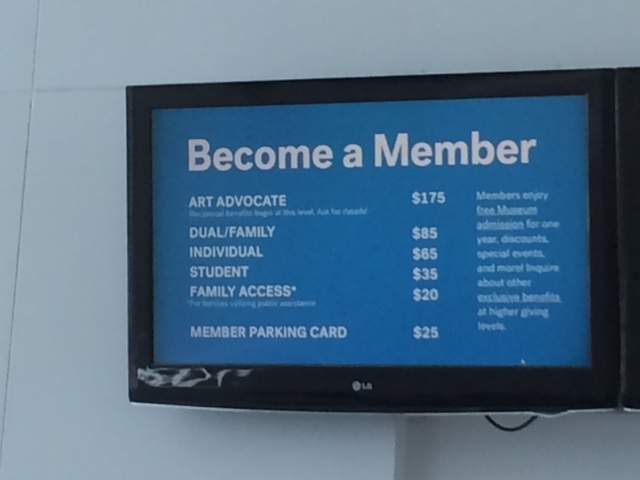 One of the things I admired about the Milwaukee Art Museum is that their membership sign very clearly listed its access membership program, allowing low-income families to purchase $20 annual memberships. I did wonder if it would have been useful to list something similar on the admissions sign – an access admission ticket that allows new visitors to enter free or for $1, before deciding to spend $20 on a membership. When we are able to determine that visitors are new to children’s museums (often a tricky call for the front-line staff) the best approach is to gather the group and explain the museum rules in a welcoming way. In this way, instead of telling visitors that how their behavior is incorrect, we can orient visitors by clarifying the code of behavior needed to successfully navigate a new space, while preventing behavior that alienates other visitors. This is surprisingly effective, stopping behavior such as splashing other visitors at the water table and throwing things down from our mezzanine. (3) Explicitly invite minorities to be part of the museum. “Shared authority” is a popular phrase these days. And museums are sharing authority in many effective ways. At the PlayHouse, through our Celebrate Peoria series, we invite cultural partners to create programming sharing their heritage and traditions with visitors. Partners include the Islamic Center of Peoria, the Jewish Federation of Peoria, and the Hindu Temple of Central Illinois. I do think these events are useful in diversifying the museum beyond these events: Once people are welcomed, they may come back. 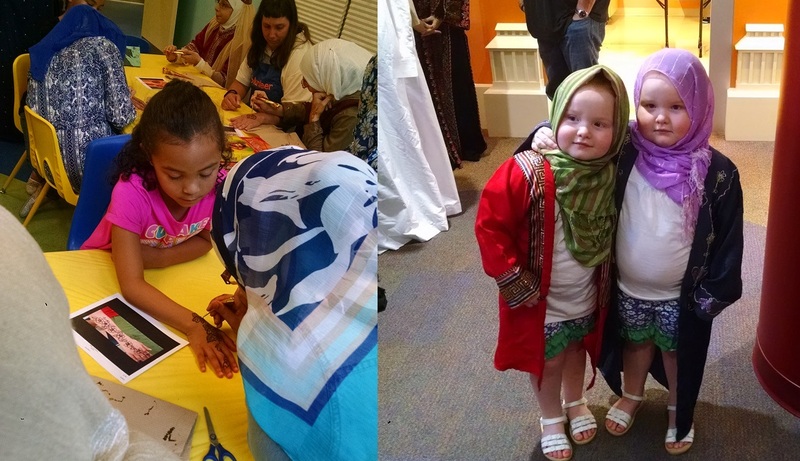 At our Eid-al-Fitr event, a number of members of the local Muslim community purchased museum memberships. But this approach has its limits. First, it is problematic to celebrate a culture only once a year. Second, there are groups we want to recognize and invite in to the museum that don’t fit neatly into this programmatic structure. We celebrate Kwanzaa and have talked about celebrating Juneteenth, but how many Black families in Peoria really celebrate either of these? And we want to explicitly welcome families with two moms or two dads into the PlayHouse, but celebrating LGBT families doesn’t fit neatly into the Celebrate Peoria model, either. As a side note, we are currently planning a half-day, facilitated retreat for Celebrate Peoria lead partners, and selected other community members, during which participants can really get to know each other, including asking all of their questions of each other. We hope that this retreat will help us form a committee that is knowledgeable about the diversity in our city, and help us find ways to deepen our Celebrate Peoria initiative. (4) Get the word out. Advertising in the same newspapers and magazines you read, purchasing billboards in the parts of town you frequent, and posting on facebook are effective to tell people just like you about the work you are doing. But they are not very effective at reaching other groups. At the PlayHouse we have an “Explorer Pass” program that invites low-income families to visit for free, and to purchase $10 annual memberships. While people do use these memberships, I suspect the vast majority of eligible families do not know about them. We are still figuring out how to let low-income families who have never heard of our museum, or who feel it is inaccessible to them, know about this program. (5) Involve the entire museum. Many of the calls for social-justice-related programming, and meaningful dialogue in museums spaces, come from the Education Department. But the entire museum needs to be involved in order for these initiatives to work. Curators must think about how objects, exhibits, and text can contribute to (or detract from) this goal. Marketing departments are essential to getting the word out about any program. Visitor Services staff must be fully invested in welcoming new visitors. If this initiative is not embraced from the Board level down, it will not be effective. I hope that a few years from now, at least visitors like our Christmas advocate will have changed their tune. That the biases of their world will become apparent to them through introducing them to the people who live all around them, and who they rarely, if ever, meet. Recently the wife of the Imam at the Islamic Center of Peoria had a terrible experience: she was driving down the street and a man in a car next to her started yelling racist things at her. I want this man, and his children, to visit the PlayHouse and learn about Muslim culture, and Hindu culture, and Jewish culture; to meet and talk to African Americans and gay parents; and to understand that we live in a world beautifully populated by people from different backgrounds who all make up this city.